Live Evil is back in October 2013 with the best line-up yet and a new, bigger venue! The weekend of October 18th, 19th and 20th this year will see the third full Festival in it's new home at The Garage in London Islington. 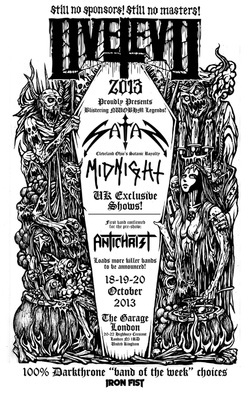 Live Evil very proudly announces the only UK shows this year from the blistering reformed NWOBHM legends SATAN and Cleveland, Ohio's Satanic Royalty MIDNIGHT. Both acts are devastating live and will add legendary shows to Live Evil's many previous highlights. The Saturday and Sunday days will be completed by an all new selection of the cream of the international metal scene playing on the venues two stages. More line-up announcements will be made in good time via the Official Live Evil Facebook page. 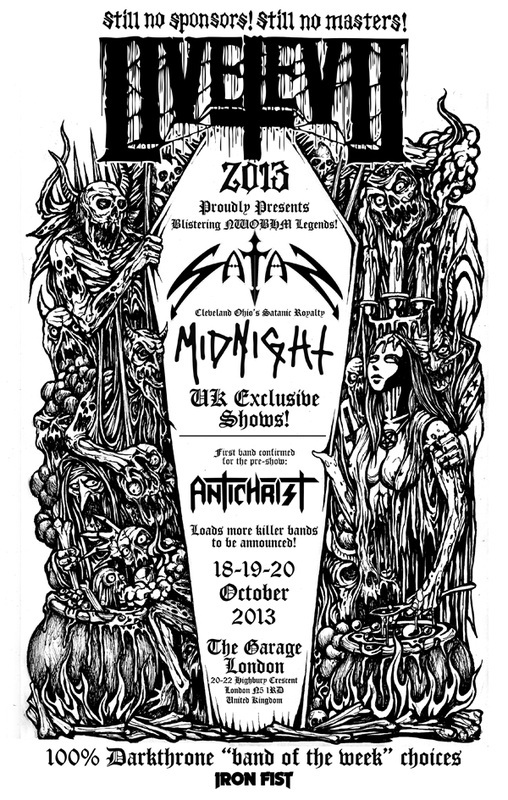 We can also announce now that Swedish thrash wunderkinds ANTICHRIST are back to obliterate the Friday pre-show party. This evening show will be ticketed separately from the two weekend days and will also take place upstairs at The Garage. Live Evil Festival is an International Heavy Metal Festival presenting the very best underground Black metal, Thrash, Speed, Death, Heavy Metal, Heavy Rock, Metal Punk and Doom bands from around the world. The bands who play it are all picked by Live Evil but using Fenriz and his Darkthrone 'Band of the Week' choices as an extensive but shortened list to eliminate industry pressure and nepotism. It's worth noting that Live Evil suggests bands to Fenriz to be considered for selection as 'Band of the Week'.